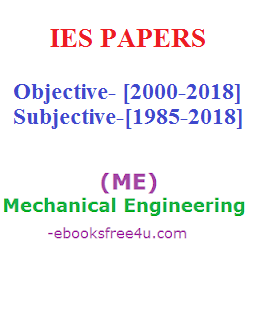 Download IES Mechanical Engineering Objective Previous Years Papers Collections Here you can Download IES Mechanical Engineering previous years objective papers from 2000-2018. These papers will help the candidates in their IES 2019 examination preparation. Candidates have to remember that there are five papers for IES examination. Candidates have to prepare for both kind of papers i.e., Objective as well subjective papers here you can also download previous years subjective papers from 1985-2018. 1. IES Mechanical Engineering Subjective Paper 2018 NOT Av. 11. IES Mechanical Engineering Subjective Paper 2008 NOT Avl.